You can make an apple pie two different ways. One involves cooking up an apple pie filling and for this you must cook the apples first. The second kind, however, starts with raw apples. The heat that bakes the pie bakes the apples. The two methods yield slightly different kinds of pie. To make apple pie from cooked apples, cook the apples and sugar in boiling water for five to seven minutes. It makes the apples a little more tender. If you like the apples in your apple pie to be falling apart, cooking them first helps achieve that goal. The water from the cooking is thickened with cornstarch to make the filling that surrounds the apples in the pie. In general, a cooked apple pie is juicier and softer than a raw apple pie. If you are making your own home-canned apple pie filling, you will also be cooking the apples. You will cook the apples for apple pie filling during two different stages of the canning process. First, blanch the apples in water to which you have added ascorbic acid crystals. Doing so keeps them from browning. After cooking up the filling from apple juice and canning-safe cornstarch, add the apples and pack everything into jars. The second cooking takes place in the jars while the pie filling is in the pressure canner. Perhaps the most common way of making apple pie is with fresh apples. Simply peal and slice the apples. Don't cook them. Just keep them in cold water to keep them from browning until it's time to assemble the pie. Coat the raw apples with sugar and flour and pour them into the crust. Top the pie with a top crust. In the oven, the juices of the apples will mingle with the sugar and flour as the pie bakes. Together they will thicken and make the juicy filling that surrounds the apples in the pie. If you are starting with dried apples, the process is a hybrid of the cooked and fresh apple methods. First cook the dried apples in water. Cover them and let them sit to reconstitute. Once the apples are reconstituted, drain them and make the pie just as you would if you were using fresh apples. 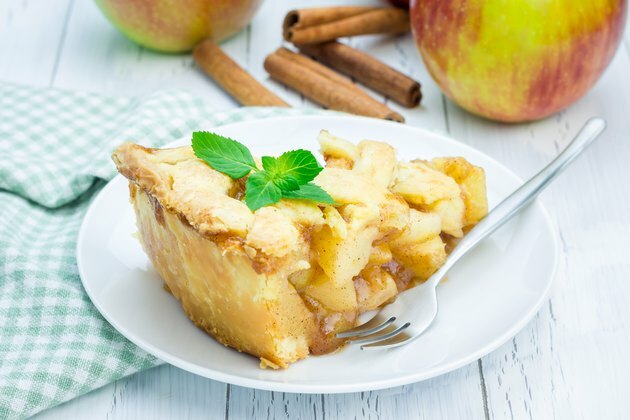 What Can I Replace Cornstarch With When I Bake an Apple Pie?